Throughout the years, mid-size sedans have served as fitting representatives of American suburban culture. Countless generations of people have depended on mid-size cars to deliver safety, efficiency and an overall fun driving experience on a consistent basis, and today we have two of the best at their craft on display. The 2017 Mazda6 and 2017 Volkswagen Passat are celebrated in the industry for their commitment to quality and durability, but how well do they match up against each other? Our team at Avondale Mazda wants to help you make a decision about which mid-size sedan is best for you, so we decided to put the Mazda6 and Passat up to the test in some key factors that are important to you. Let’s jump in and see what these two are capable of providing for you and your family! 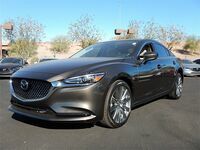 The 2017 Mazda6 near Phoenix AZ and 2017 Passat are two of the most highly regarded vehicles in the entire automotive industry, making them both worthy choices for you as a driver. Both have been named IIHS Top Safety Picks and provide top of the line tech innovation, but there are some ways that the 2017 Mazda6 effortlessly cements itself at the top of the pack. For one, its SKYACTIV®-G Inline 4 engine is consistently rated one of the most efficient on the market, helping the Mazda6 achieve up to 35 highway miles per gallon while still producing 184 horsepower; both numbers far exceed the output of the 2017 Passat. In addition, the available Head-Up Display and MazdaConnect™ infotainment system available in the Mazda6 prove that your drive can be fun and functional at the same time. If you’d like more information on the 2017 Mazda6, or would like to get behind the wheel for a test drive, feel free to contact our sales team here at Avondale Mazda. We’ll help you with anything you need and even get you a budget-friendly financing deal if you’re convinced that the Mazda6 is the mid-size sedan for you.